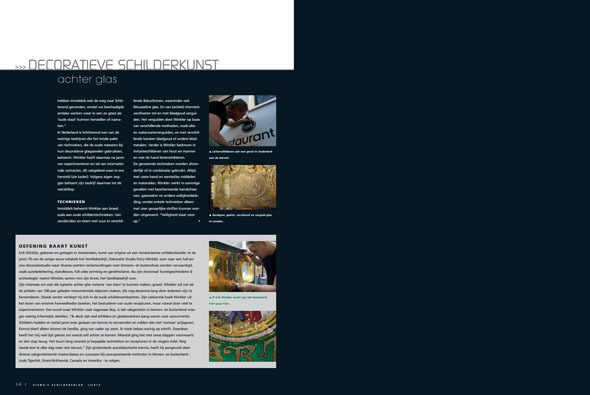 Recently an article about Schitterend was published in Eisma’s Painters Magazine. 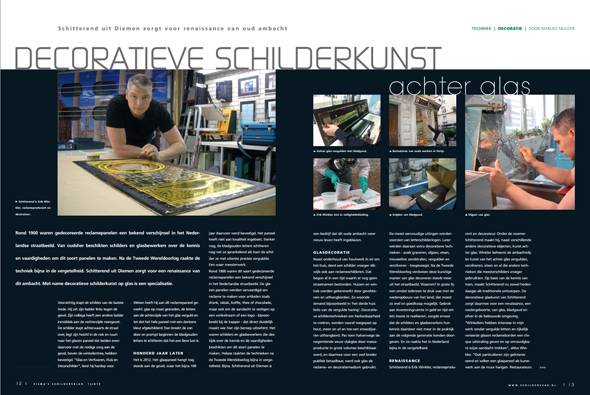 This leading magazine has long been the magazine for the overall painting and maintenance industry in The Netherlands and wanted to dedicate an article wanted to my decorative painting techniques behind glass. I consider it a great compliment and a piece of recognition for my work. The article, richly illustrated with photographs, describes that the painters of yesteryear also had knowledge and skills to decorate glass. They did this to make of shop facades and billboards eye-catching promotional objects. Objects that entices the passerby to have a look at the goods within the store. The decorative craft techniques the painters used to use were quite diverse, for example glass etching, gilding, silvering and imitation marble & wood painting. It showed an eye for detail, a steady hand and knowledge of materials. Unfortunately this kind of glass decorating was almost lost after WWII. Winkler has spent the last few years to find all the old fragmented knowledge and put it together in order to make these techniques his own. Eisma’s Painters Magzine has now announced Winkler’s specialist knowledge amongst a large group of skilled painters and other craftsmen. Are you curious? Click here to read the entire article, but I must warn you though: The article is in Dutch. So we also made a translation. Click here to read the English translation of the article. The article is accompanied by beautiful pictures, which you can see in the photo slider that you can access by left clicking the "see all examples ......".